The Gun Almost Smokes, Pt. II: Potentially serious conflicts of interest at the USA Expo 2010 pavilion. For more than a year, the USA pavilion at Expo 2010 has been shrouded in inexplicable secrecy. To this day, for example, the State Department won’t reveal the process by which Shanghai Expo 2010, Inc [SE 2010] – the non-profit it authorized to design, fund, build and manage the US pavilion – was selected; who and how a Canadian architect was chosen to design the US pavilion; or, for that matter, release a detailed budget on how SE 2010 was spending its $61 million in tax-deductible contributions. Unfortunately, the first two questions are still mysteries: the State Department, SE 2010, and the US Consulate in Shanghai have been obstinate in their refusal to answer questions on these matters. However, the last question – a detailed budget – received a partial answer last week when I published a cost estimate that SE 2010 had filed with the IRS in June 2009. Readers will recall that the IRS documents indicated that SE 2010, Inc was spending US$23 million for the three short films that are featured in the USA pavilion (a sum that exceeds the cost of 4 of the ten Academy Award nominees for Best Picture). No surprise, the producer of the three films – BRC Imagination Arts of Burbank, California – is, according to the June 2009 IRS documents, the pavilion’s top-paid contractor [click to enlarge]. 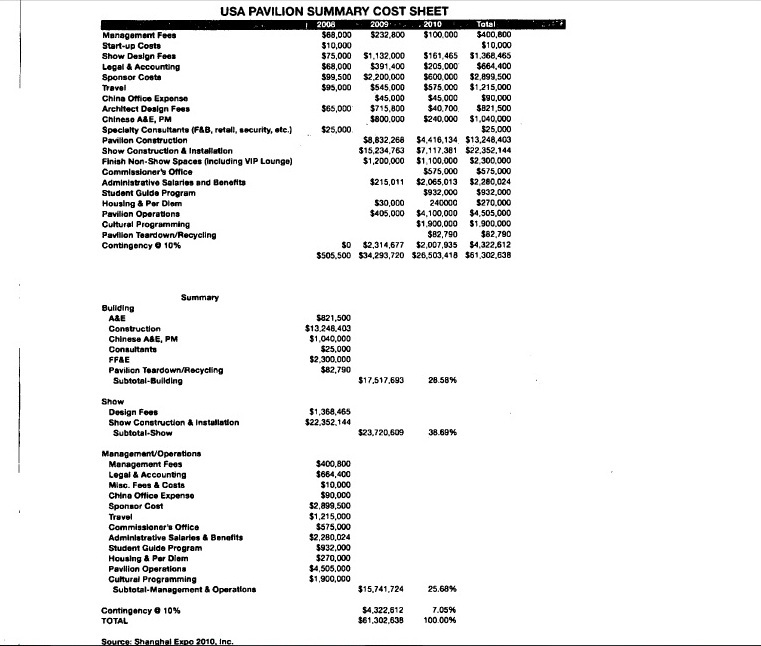 In the above document, BRC is promised US$10 million for Production Design/Fabrication; according to individuals associated with two other national pavilions, that $10 million most likely folds into the $23 million for “show construction & installation” in the cost sheet. In any case, no other contractor is listed in the IRS filing; BRC is the largest. Of course, there’s the possibility that Covington & Burling mistakenly submitted an out-dated resume to the IRS. But if so, nobody with knowledge of the Winslow-BRC relationship is willing to comment upon it. On Thursday, I personally contacted Winslow, Bob Rogers, CEO of BRC Imagination Arts, Martin Alintuck, the Spokesman for the USA Pavilion, and Scott Walker, a Public Affairs Officer at the US Consulate Shanghai. In each case, I asked for detailed information on Winslow’s business and financial relationship to BRC Imagination Arts (and, in the case of SE 2010 and the Consulate, I submitted the resume). So far, not one of the individuals or organizations queried – Winslow, Rogers, Alintuck, or Walker – has bothered to respond to me. Presumably, if the answer was that there was no current relationship between Winslow and BRC, they would’ve let me know by now. Perhaps other reporters will have more success. So why should any of this matter? Does it matter? The short answer is: yes, it matters a lot. 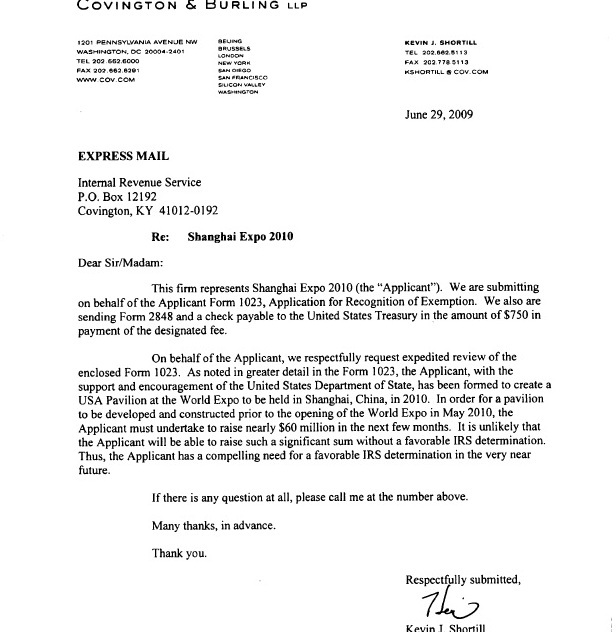 SE 2010, Inc, the non-profit corporation that was authorized to design, build, fund, and manage the US pavilion, was awarded 501(c)(3) status by the Internal Revenue Service. Among other privileges, 501(c)(3) status allows SE 2010, Inc to raise tax-deductible contributions from individuals and corporations. Without the ability to offer tax-deductible contributions, SE 2010 Inc would have found it near impossible to raise the $61 million it claimed was necessary to build a US pavilion, a fact acknolwedged in Kevin Shortill’s cover letter requesting an expedited approval of SE 2010’s 501(c)(3) application (click here to see the cover letter). And I think I’ll leave the editorializing on what should or should not be done in regard to this matter to others. My sincere hope is that, in addition to the IRS, the State Department, the US Consulate Shanghai, and Jose Villarreal, Commissioner General of the USA Pavilion, will take the questions raised here seriously. This entry was posted in Expo 2010 - US Pavilion and tagged Expo 2010, Nick Winslow, us pavilion, USA pavilion, USA pavilion cost by Adam. Bookmark the permalink.